A fan without blades — how cool is that? Cutting-edge home technology creator Dyson, which has broken the mold on such varied products as vacuums and hair dryers, is also leaving its stamp on desk fans. But if you’re wondering whether a 10-inch desk fan should cost you $300, we’re here to break down everything you need to know about the Dyson AM06. The Dyson AM06 is one in a series of air technology products from Dyson. There’s also the AM07, a nearly $400 tower fan, and the AM09, a roughly $450 fan heater, among a few others. We’ll be focusing on the AM06, a 10-inch desk fan that’s Dyson’s least expensive cooling fan. It stands 19.7 inches tall, weighs 4 pounds and has a 6.6-foot cord. Built with a 10-inch amp diameter and a 5.5-inch base diameter, the fan is sold in black/nickel, white/silver and iron/blue color combinations. With purchase, consumers will receive the fan itself, as well as a remote control that can be used to turn the device on/off, navigate through 10 airflow settings, and adjust oscillation without touching the fan. The hefty price tag and sleek design aren’t the only distinguishing aspects of this Dyson product. We rounded up a handful of the most compelling features that could play into your purchase decision. Safety. There are no blades in this fan, so it’s safe, especially for homes with young, adventurous children. Cleaning. No blades also mean less nooks and crannies where dust can congregate. That makes this Dyson a breeze to wipe clean. Convenience. 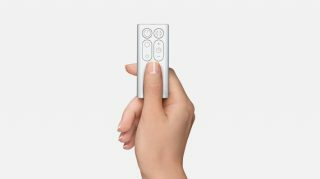 The AM06 comes with a sleep timer, allowing users to choose a preset time interval (between 15 minutes and nine hours) after which they want the device to automatically switch off. That can save you energy and effort. Noise. The AM06 is undeniably quiet. 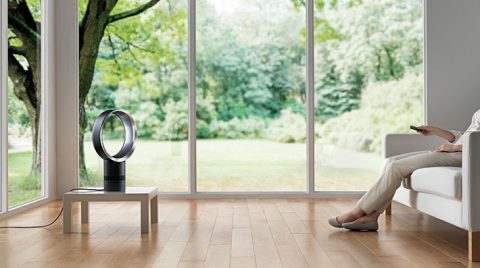 Dyson claims it’s 75% quieter than the AM01, an older table fan model from the brand. Adjustability. One size doesn’t fit all for most things in life, including fans. That’s why the AM06 can be tilted for a better angle. It also has 10 speed settings and an option for oscillation to direct air throughout a room. The Dyson AM06 doesn’t come cheap. It retails for $299.99 from Dyson, but we’ve seen it discounted occasionally during the manufacturer’s sale periods. 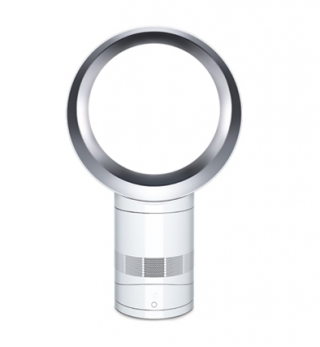 You won’t always be able to get the fan for less at Dyson, so before you buy, shop around. Amazon has also sold the fan at a sale price in the past, in addition to offering refurbished models for a more affordable alternative. Thanks to its streamlined design and advanced features, the Dyson AM06 is unlike any other desk fan you’ve ever seen. But is it worth it for you? For smart homes with the latest in technology, this fan is a fitting addition. And once you get a feel for the more convenient experience, it’ll be tough to remember how you ever got by with a traditional fan. But for more casual users, it isn’t hard to find a standard desk fan for less than $20. If you can do without the Dyson’s remote control, bladeless design and sleep timer, a simple fan will suit your air-cooling needs. We’ll categorize this one as a nice luxury, but not a necessity.